Schools understand that parents are busy people, but there are many different ways you can get involved in your child’s education. No matter how little or how much time you have, there are many ways you can positively impact your child’s education at school and at home. Remember, when parents get involved and stay involved, all students achieve at higher levels. This entry was posted in Uncategorized on January 22, 2018 by APA Front Office. See what’s cooking for breakfast, lunch, and snack for the month of January! Give your heart to a friend this Valentines Day! 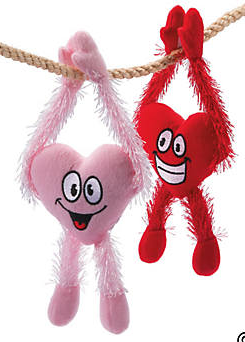 Send out a valentine gram that everyone will love, a hanging plush heart with fun dip. Limited quantity available so order now! This entry was posted in Uncategorized on January 16, 2018 by APA Front Office.